In this video I continue my Java Asteroids game. I pretty much finish up the game in this tutorial. I show you how to do a bunch of new things. I show you how to play sound in a JFrame. We introduce yet another way to handle collision detection. We remove items from the screen when they are destroyed. And, a whole bunch more is covered. All of the code is available below and in this zipped archive. Hi do u have any plan to make tutorial on magento or drupal for developing ecommerce site ? i think advanced step of this type tutorials are not available. so please …..
Not at this time because I made a free wordpress ecommerce tutorial that has worked perfectly for me for almost a year with a single problem. I don’t know of an iron clad free ecommerce solution other than what I covered in Create an Online Store. I don’t know if you’ve seen that tutorial or not? display none and visibility hidden , whts the difference of this two css property ? help me to know. visibility:hidden hides an element, but it will still take up the same space as before and still affect the layout. I also do games long time ago using Java and J2ME. I just do simple box collission detection. I think circles are much easier because you just compute the distance between the 2 centers. Hi 🙂 Thanks for visiting my site. I liked this series of video game. I just wanted to ask is this include MVC(Model View Controller) pattern. My question is what is MVC and how did you achieved in this video game. 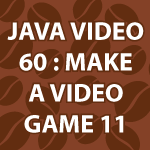 Check out my Java MVC tutorial. It should answer all your questions. Is it true that C,C++ supports more graphics option than Java. This is what you told in one of the game video series. I can do pretty much anything in Java that I can do with C++ except C++ is much faster. Hi.. I am your great fan. I learnt java from your tutorial.. You are really awesome.. Keep going. Woooooooooo!!!!!! first video game down! Just wanted to say thank you. I have learned so much through your tutorials. They may have also played a part in me getting a job, so congratulations you are feeding me now too. Thank you 🙂 My original goal was to help people find work. I’m very happy that I could help! A ton of game tutorials will start very soon.